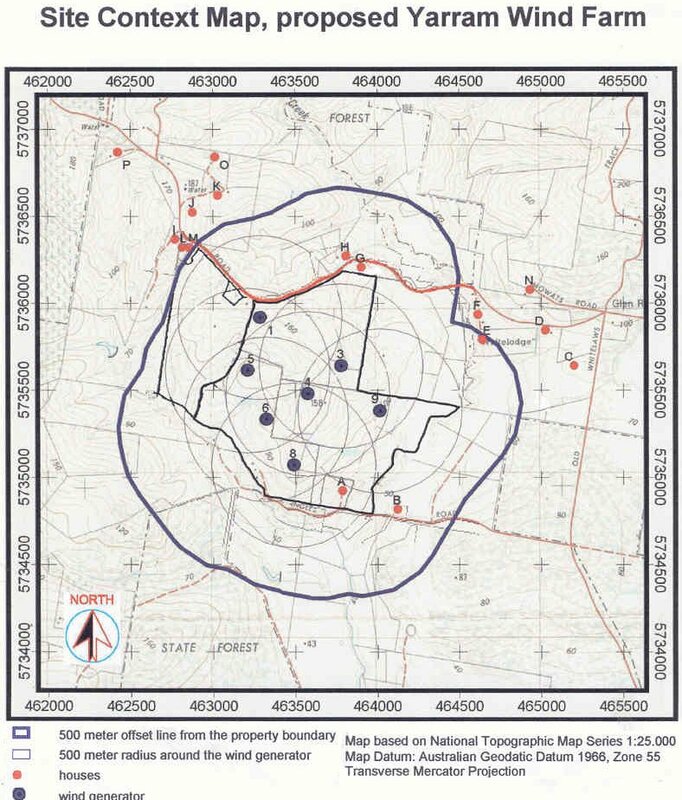 MAP - WINDFARM PROPOSAL - YARRAM AND DISTRICT, South Gippsland, Victoria. The map was provided by Synergy Wind Pty Ltd, showing the proposed seven windturbines. The location of several houses is incorrect, and some existing houses not shown. A farm shed and a dairy is shown as dwellings. Mistakes can occur, but this demonstrates that Synergy Wind have given scant concern to the accuracy of their submission, particularly when they have been advised of the errors. The map does not indicate any proposed dwellings. One proposed dwelling would be within one hundred metres of a turbine, and the sites for other existing dwellings are within 285 metres, 365 metres, 520 metres, and with a further nine existing homes within 900 metres. So much for Synergy Wind's assertion that there are few neighbouring residences. K Dairy - not a residence. Note that the above residences, with the exception of 'A', the windfarm property owner, are all private dwellings on small acreage, and are not farms. Synergy Wind, in their application for permit, fail to recognise these residences as non-farming properties, and indicate that the windarm property is surrounded by rural farms and state-owned properties, with "few houses adjoining the wind farm site". Some properties will have several turbines within a 500 metre distance. Why Synergy Wind choose 500 metres as a criteria for location is a mystery. A property within 1000 metres will hav just th same concerns as one within 500 metres - visual intrusion, noise, flicker, electromagnetic interference, construction and maintenance intrusion. Indeed, it is recommended that a 5000 metre radius exclusion zone for residencs be established, including the windfarm property owners own residence.